Got the knowledge to navigate a hexagonal grid from left to right to scoop a top prize? Come try your luck as Fremantle revive the classic Blockbusters quiz show across slot reels! Based on the quiz show created by Steve Ryan and Mark Goodson that resulted in the production of over 1500 episodes since first airing in 1983 on ITV (but since then moved around with Sky One, BBC Two and Challenge all airing a series at one time or another), it saw the late Bob Holness, Michael Aspel, Liza Tarbuck, and Simon Mayo all take a turn at presenting. The hexagonal grid displayed letters which were the start of the answer to a question and players had to get it right to select another position, with the winning player advancing to the Gold Run where the grand prize could be won! Designed just like the original board used in the television show with hexagons and the famous blue and yellow colour scheme, the Blockbusters slot machine is a 5-reeled slot with 15-paylines and it can be played from as little as 1p up to a maximum of £25 per payline which means all paylines being active will see you spin the reels for 15p up to £375 each time. With the original soundtrack accompanying gameplay you’ll feel like you’re participating yourself – and very big wins are on offer in the Gold Run feature! The Blockbusters quiz show was pretty simplistic so there wasn’t all that much excitement that Fremantle could have added to the reels when designing the symbols to be used, but one can’t help but feel a better job could have been done. There are no symbols representing the hosts, contestants or even the mascots that contestants had. Instead it’s the rather plain, dull and boring symbols of grid positions that feature – a far cry from the modern 3D slot machines we are so accustomed to in this day and age, but saying that the style is in keeping with the 80’s era when the show first aired. Those that do feature on the famous grid are a Wild symbol that can appear on the second, third, fourth and fifth reels but not the first, which has the ability to substitute for all but the Gold Run Scatter symbol and when it is part of a winning combination it triggers the Expanding Wild feature. This simply sees the symbol expand to cover the whole reel which usually results in additional winning combinations being made. 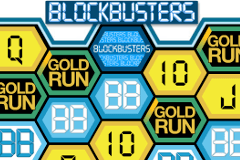 The Gold Run Scatter symbol simply states the words and is needed for the bonus game while the Blockbusters logo, the famous grid, blue and white BB’s, plus the standard lo-valued Ace to 10 playing cards which are hexagonal. Ready for a Gold Run? In the quiz show the winner of the match progressed to the Gold Run bonus round, and Fremantle have made it the pinnacle of the slot machine too. This saw green hexagons used with letters on them representing the initials of the answer to a question and the board appears the same in this feature – but thankfully you’ll have no questions to answer. Triggered by landing three or more of the Gold Run Scatter symbols on the reels, it’s simply a pick ‘em game where you have to navigate from left to right picking positions to move to in order to reveal a cash prize while dodging an ‘Exit Bonus’ which sees your progress halted. Once finished, a congratulations screen displays with colourful stars bursting in the background plus the total amount you have won splashes across screen before your balance is boosted. Does it Live Up to Its Title? Unfortunately, no, the slot machine is certainly not a blockbuster or one that you’ll be bookmarking to come back and play – unless you play slots online for free rather than real money. That isn’t necessarily Fremantle’s fault though as there are no frills and thrills in the TV quiz show but for those of you who grew up in the 80’s it’s a chance to relive a classic gameshow. It’s certainly not a patch on their other TV-themed slots with my personal favourites being the Hole in the Wall slot machine and the Family Fortunes slot machine which both boast much slicker graphics and more entertaining (and most importantly, rewarding) bonus features!